Jim Cornelison preparing to sing the Star-Spangled Banner prior to the Chicago Blackhawks vs New York Islanders game, on January 9, 2011. James Cornelison (born June 20, 1967) is a baritone who sings "The Star-Spangled Banner" and "O Canada" at the beginning of home games for the Chicago Blackhawks. 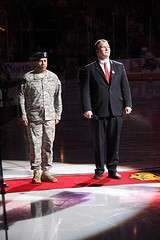 Cornelison started singing the anthem for the Blackhawks part-time in 1996; he has been singing the national anthem for the Blackhawks full-time since 2007. He has also performed the anthem before Chicago Bears home games at Soldier Field during the 2010-11 NFL playoffs, as well as the 2011 season opener against the Atlanta Falcons, which fell on the tenth anniversary of the September 11 attacks. Jim also sang at the 2015 NASCAR MyAFibRisk.com 400 race at Chicagoland Speedway. Most recently, Cornelison performed the National Anthem at the Chicago Bear's 2016 home-opener against the Philadelphia Eagles, a controversial one given the recent Colin Kaepernick Protests. Cornelison graduated from Seattle Pacific University with degrees in music and psychology. He then went on to earn a master's degree in music from Indiana University in 1992. In 1995, he moved to Chicago and joined the Lyric Opera Center for American Artists. ↑ Johnson, Steve (June 6, 2010). "Of arias and anthems". Chicago Tribune. ↑ Morreale, Mike G. (2010-05-29). "Anthem in Chicago a tradition like no other". Chicago Blackhawks. Retrieved 2011-01-19. ↑ Dizikes, Cynthia (2011-01-18). "Cornelison to sing anthem for Bears; DeWyze maybe halftime". Chicago Tribune. Retrieved 2011-01-19. ↑ Modrowski, Roman (2011-05-02). "Jim Cornelison to sing anthem". ESPNChicago.com. Retrieved 2011-05-02. ↑ Staff Writer (2011-01-19). "JIM CORNELISON". Rubloff Residential Properties. Retrieved 2011-01-19. ↑ Staff Writer (2011-01-19). "JIM CORNELISON". Chicago Blackhawks. Retrieved 2011-01-19.